QUEBEC CITY, Sept. 21, 2018 /PRNewswire/ - EXFO (NASDAQ: EXFO) (TSX: EXF), the communications industry's test, monitoring and analytics experts, today announced the integration of their active service assurance solution into Amdocs NFV powered by ONAP (Open Network Automation Platform). Delivering real-time, active testing and monitoring functionality as an integral part of ONAP, provides the foundation for fully autonomous service assurance in support of orchestrated service lifecycle management operations models. EXFO's active service assurance probes and test orchestration platform provide NFV-based service activation testing and real-time service monitoring. 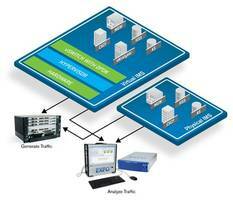 The solution delivers 100% end-to-end visibility of virtualized services and network performance. Closed-loop, autonomous network and service management solutions demand extensive insights to support policy driven operations. EXFO's active service assurance solution supports the industry's most complete set of service and network KPIs, enabling unmatched, end-to-end visibility for quality of experience optimization. Partnering to deliver open, standards-based networks. As a key member of Amdocs Open Network Partners Program, EXFO's solutions are fully ONAP onboarded and certified, greatly simplifying adoption, reducing costs and allowing carriers to focus on the delivering new, innovative services demanded by their customers. "Virtualized networks and services challenge the carrier's ability to manage end-to-end service quality since they are continuously changing" says Abdelkrim Benamar, EXFO's Vice President, Service Assurance, Systems and Services. "Embedding active service assurance in the service chain and making it an integral part of the service definition, gives service providers the ability to automate the entire service lifecycle and drive autonomous network and service optimization–unleashing the true benefits of virtualization". "With EXFO's vVerifier virtual network functions onboarded to Amdocs NFV powered by ONAP, CSPs can easily and efficiently build self-monitoring services and closed-loop operations policies, reducing time to market and operational costs, and improving customer experience," said Yogen Patel, VP, Head of Marketing for Amdocs Open Network. "The Amdocs EXFO NFV solution provides end-to-end visibility and monitoring and control of dynamic service-oriented, cloud-centric, NFV and hybrid networks." For further details about this solution, click here. EXFO (NASDAQ: EXFO) (TSX: EXF) develops smarter test, monitoring and analytics solutions for fixed and mobile network operators, webscale companies and equipment manufacturers in the global communications industry. Our customers count on us to deliver superior network performance, service reliability and subscriber insights. They count on our unique blend of equipment, software and services to accelerate digital transformations related to fiber, 4G/LTE and 5G deployments. They count on our expertise with automation, real-time troubleshooting and big data analytics, which are critical to their business performance. We've spent over 30 years earning this trust, and today more than 2,000 EXFO employees in over 25 countries work side by side with our customers in the lab, field, data center and beyond. For more information, visit EXFO.com and follow us on the EXFO Blog.